Aerotecs NV were selected by Brussels Airlines Maintenance Department to fully manage replacing their ageing Frequency Converters with new, more efficient units, to lower energy consumption and increase conversion rate. Aerotecs commissioned Red Box International to design, manufacture and help install the new, innovative units. Aerotecs were chosen as the total solution provider to co-ordinate the entire project for Brussels Airlines. This included the study of the current set-up and requirements for the project, removal of the old units, design and installation of the new units, and conditioning, training and full ongoing support. The hangar where the units are housed is divided into three sections, with each section having its own Frequency Converter Unit. Each unit is made up of a central column and two 120kVA Frequency Converters, powering two groups of three pits. One of the 3 units has a 7th output to power a workstation with up to 30kVA. Aerotecs, who currently represent Red Box International in Belgium, The Netherlands, Luxemburg and France as well as having a strong customer base in the United Kingdom and Ireland, commissioned Red Box to design and manufacture the new units. The team at Red Box worked closely to the brief set out by Aerotecs to design the innovative pit distribution and aircraft interlocking system. Each of the three units provides 6 x 115VAC 3 phase 400Hz outputs. 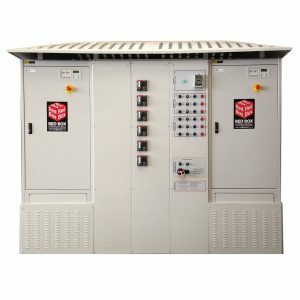 The RBC7000 dual Frequency Converter and Pit Control units have the ability to secure each of the 19 pits separately for maintenance and safety. They allow for minimum changes in operator use, and are able to supply all pits currently installed in the hanger, even with one converter inoperative or in partial maintenance. The units have been designed with the newest aircraft generations in mind, future proofing them for decades to come. Brussels Airlines Hangar 41 is now fully ready to power 3 Airbus A330 at the same time at full capacity, whilst in the meantime powering a remote repair workshop for servicing coffeemakers and ovens. Aerotecs is the European distributor of highly qualitative aircraft testing-, tools- and ground support equipment. With our UK branch office and head office in Belgium, Aerotecs provides you with the best solution for almost all aircraft maintenance enquiries. Additionally, Aerotecs runs a fully certified service repair- and calibration center to keep your test equipment in the best accurate state. Based in Romsey in the United Kingdom, Red Box International have been manufacturing Ground Power Equipment since 1993 and now provide a comprehensive range of ground power units and a wide selection of ground support equipment including; Aircraft Tugs, Aviation Tools, Tool Control Systems, Hangar Cooling Systems, Cable Assemblies and Inspection Cameras.